There are two ‘Rehoming’ processes we have. The first is to take into our care Scottish Terriers, and the second process is to find them a new home. Both these processes can be called ‘Rehoming’. Find out which ‘Rehoming’ process you require, then just follow those instructions. 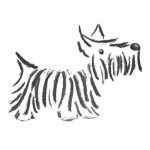 If you have a Scottish Terrier that you are no longer able to look after and would like to place into our care, you have come to the right place. Just give us a ring on 07504 500032 and we will discuss the next steps with you. Detailed below are some of the questions we would like to ask you. Age and gender of your scottie. In general, we like to get to know your scottie before we all meet in person. You will be asked for a convenient date/time for us to meet, after which your scottie will be transferred into our care. There will be one document for you to sign, which will cover the information above and that’s it. We know that you will worry about your scottie, but rest assured, our scotties receive only the very best care and attention as they adjust to their new life. If you wish to provide a new home for one our scottish terriers, we will need you to complete an Application Form. There is a small donation upon successfully ‘rehoming’ a scottie and this will be discussed with you when you request an Application Form.